I met the wonderful director of Melbourne shoe label Radical YES, Kerryn Moscicki back in 2015 after getting my hands on a pair of their amazing toe tappers. Earlier this year Kerryn invited me to collaborate with her on the some work for the fit-out of their Melbourne Central pop-up project. ​We did a little photo-shoot in my studio of the boards coming along and had a bit of chat about my work and influences. Read the YES! Journal interview here. 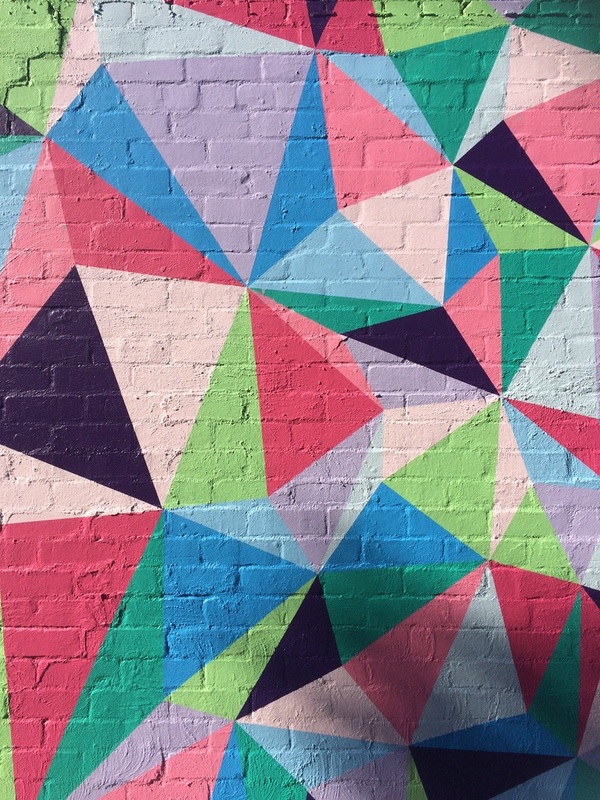 Over the past few months I've been hard at work with my partner in crime, Amanda Airs painting murals around Coburg as part of project called 'Colours of Coburg'. The palette was developed with feedback from local residents and businesses and designed to reflect the vibrant culture and community of Coburg. You can check out our work in the Victoria St. Mall off Sydney Rd and at the back of the Coburg Market. There are also lots of other fantastic murals by other artists involved with this project around town too! 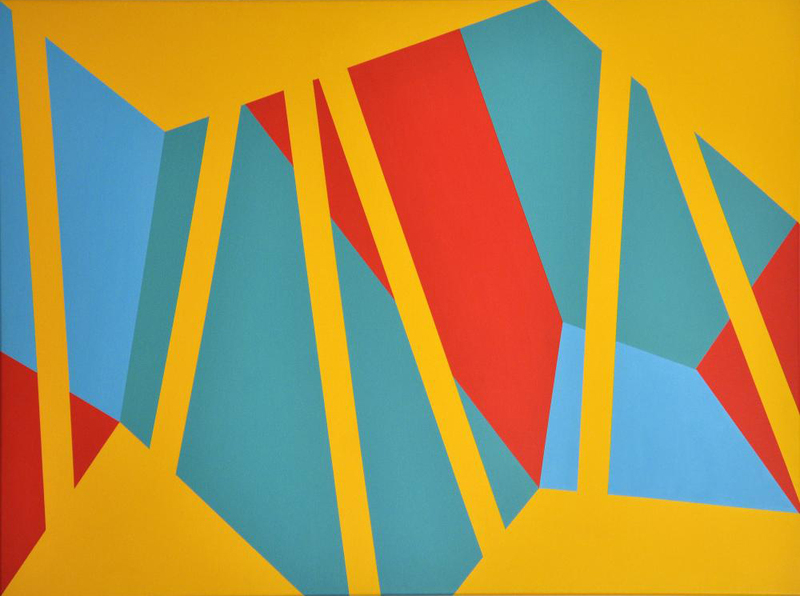 SUB/DIVIDE presents a new body of abstract works alongside a site-specific painting installation in the Alternating Current Gallery space. 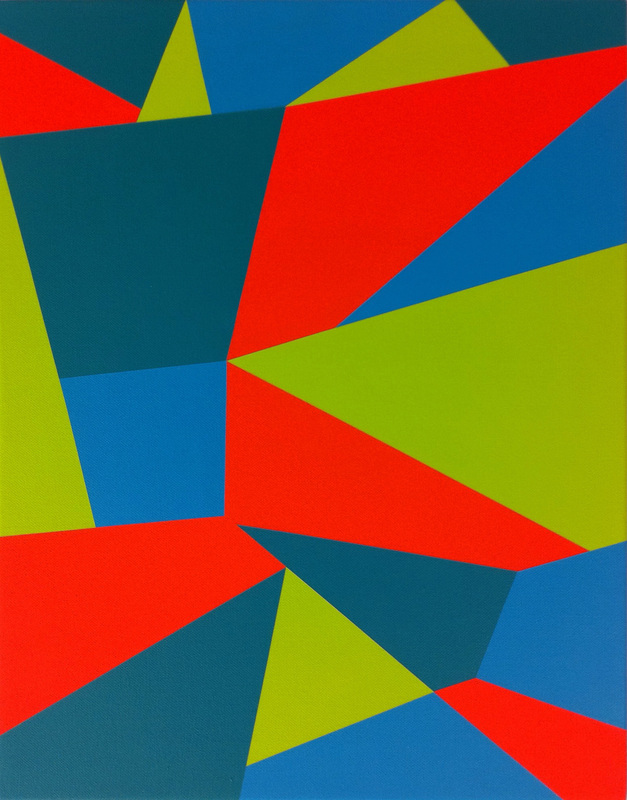 This new series of paintings on wooden panels explores my interest in using contrasting colours and oblique geometric forms to create spatially ambiguous images. 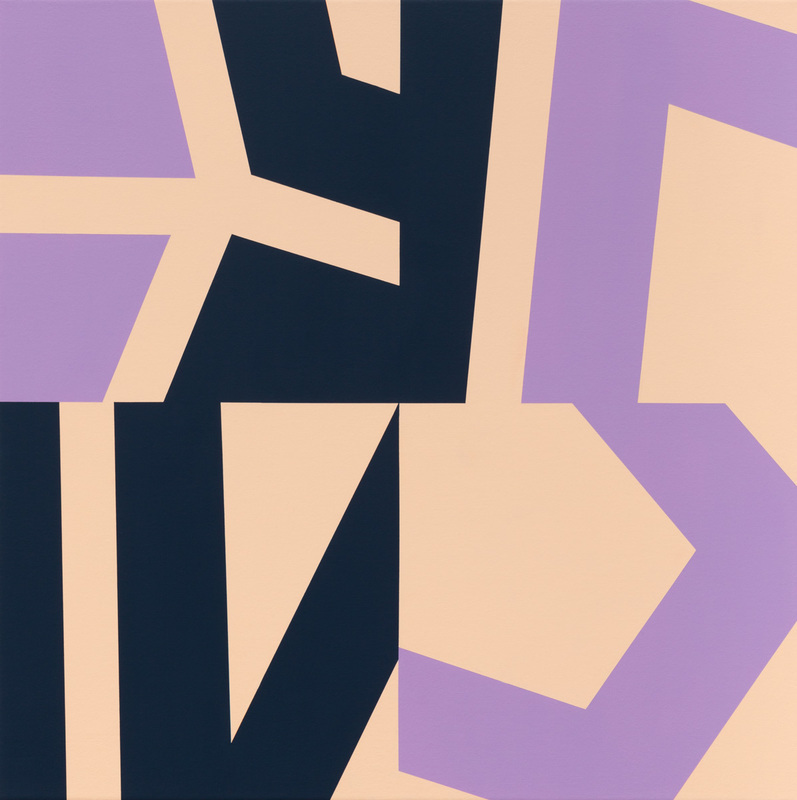 The paintings have been derived from the process of re-examining photographic documentation of older abstract works, which are then cut up and rearranged into collages using a grid format. The grid serves as a means to further disrupt and confound pictorial space, creating slippages between foreground and background. 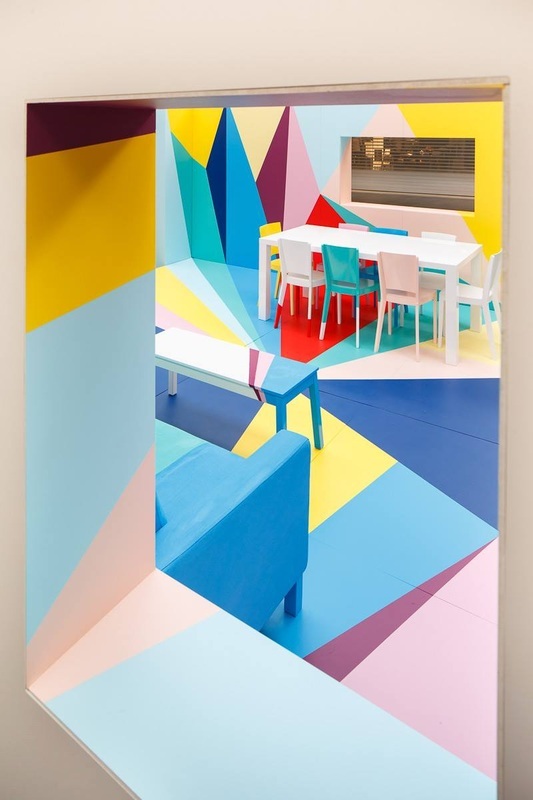 The accompanying painting installation aims to exaggerate the spatial disorientation of the painted works by extending the pictorial space onto the gallery walls. 'Art Town' is an annual project in the Chapel St Precinct that celebrates Melbourne's art scene, creatives, local people and inspirational places. Over two weekends, invited artists create works inspired by what’s around them while making the street their own very public studio. I will be set up in the 'Windsor Plaza' area on Maddox St, (off Chapel) in front of Windsor Station creating a new work inspired by the architecture and features of this public space. I will also be on Triple R's Smart Arts program on Thursday March 31st, with project director Margaret Kernich to have a little chat about Art Town and making work in public spaces. The live-art weekends will be followed by an Exhibition at Chapel off Chapel, 26 April - 14 May 2016. 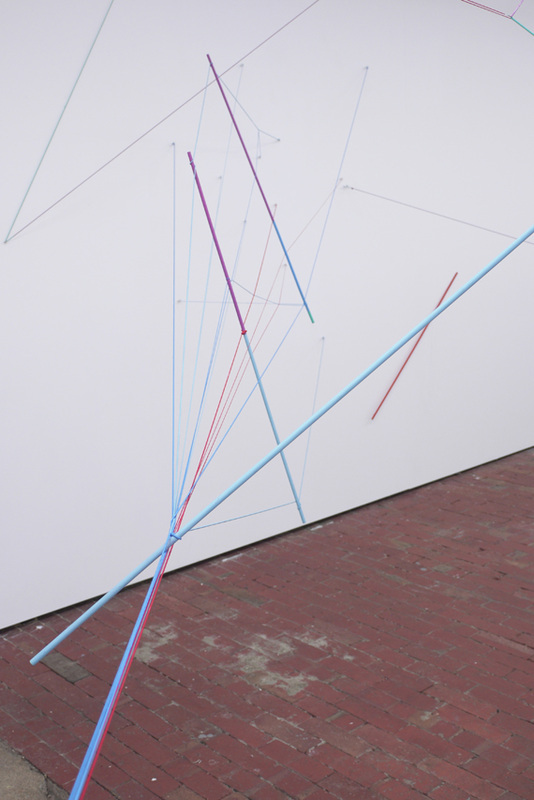 This exhibition presents a selection of works by artists who use the grid as a matrix for charting colour relationships, as a structuring device to formulate repetitive patterns, as a system for confounding visual perception, as a reference to contemporary urban spaces, as a nod to aspects of digital image construction or who prefer instead to disrupt the grid’s regularity for the sake of enhanced spatial dynamism. 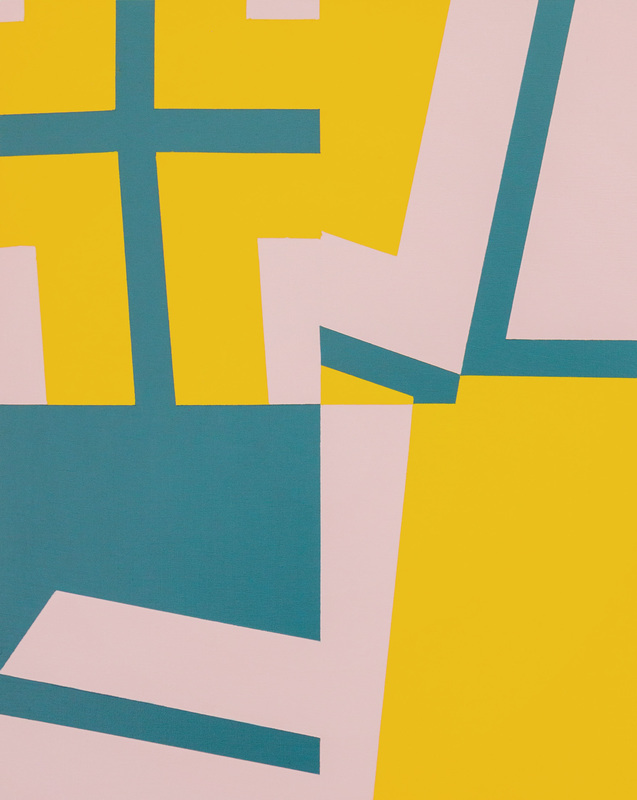 A solo exhibition of paintings and works on paper presented at Langford120. Arts Project Australia's 40th Anniversary Fundraising Auction will be held at Leonard Joel on Sunday 5 October 2014. All proceeds from the event will go towards ensuring that every artist practising in the Arts Project Australia studio has access to professional grade materials, exceptional artistic guidance, premium exhibition and promotional opportunities in our gallery, as well as national and international galleries. Arts Project Australia's success is due to the dedication of its artists, board, members, staff, volunteers, donors, as well as government and sponsorship partners. My work 'Spank' 2012 (pictured left) will be available to purchase via auction on the night. Visit Arts Project Australia to view more details and purchase tickets to the event. Here's a short video of me talking a bit about my work and The Colour Studio project at Highpoint. Videography by Diprose Media. 'Uneasy Truces', a curated exhibition by Michael Carolan brings together four pairs of artists to navigate the gallery space and each others' works. 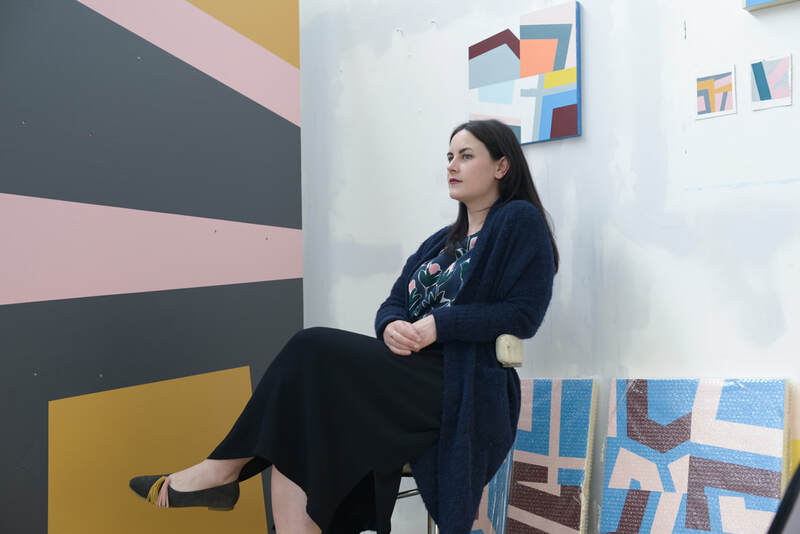 Artist pairs are Tul Suwannakit and Beka Hannah, Hannah Evans and Nick Hackett, Amanda Airs and Hayley Scilini, and Paul Candy and Michael Carolan. OPENING Wed April 16th, 6- 9pm. April 17-26, 2014. Gallery open: Thursday - Sunday 12-6pm. Time-lapse of The Colour Studio Transformation captured over 4 days at Highpoint Shopping Centre in support of VAMFF March 17 - 23, 2014. Thanks to my lovely painting assistants; Amanda Airs, Aimee Howard and Marguerite Tierney. The Colour Studio is taking place live outside of David Jones in Highpoint Shopping Centre as part of the VAMMF cultural program. 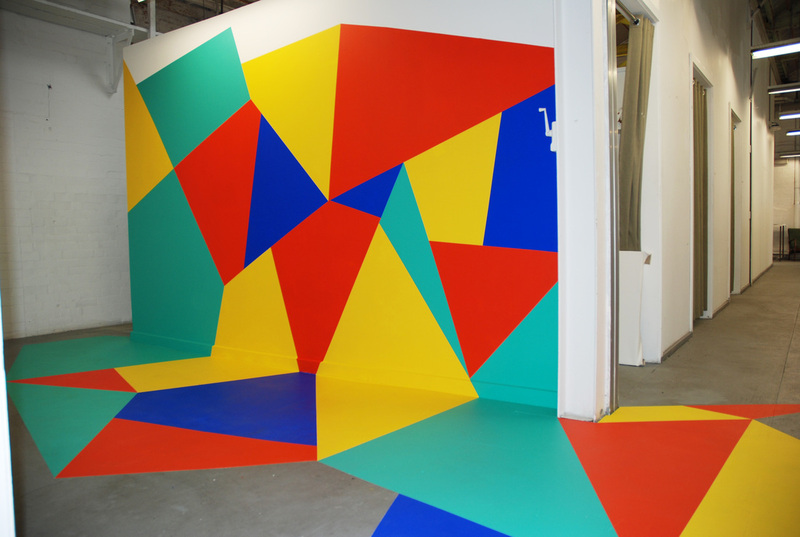 Over 4 days I will be transforming the white studio space into an an explosion of colour and shape. The installation will begin on March 8th and continue live in centre until March 11th. Pop in to see me in action if you're in the neighbourhood. The work will be a temporary installation space that will also host interior styling sessions, fashion pop-up shows and creative workshops. March 8 - 23, 2014. Features: Amanda Airs, Louise Blyton, Beata Geyer, Ollie Lucas, Susie Leahy Raleigh, Hayley Scilini, Merryn J Trevethan, Tom Vincent, Max Lawrence White. 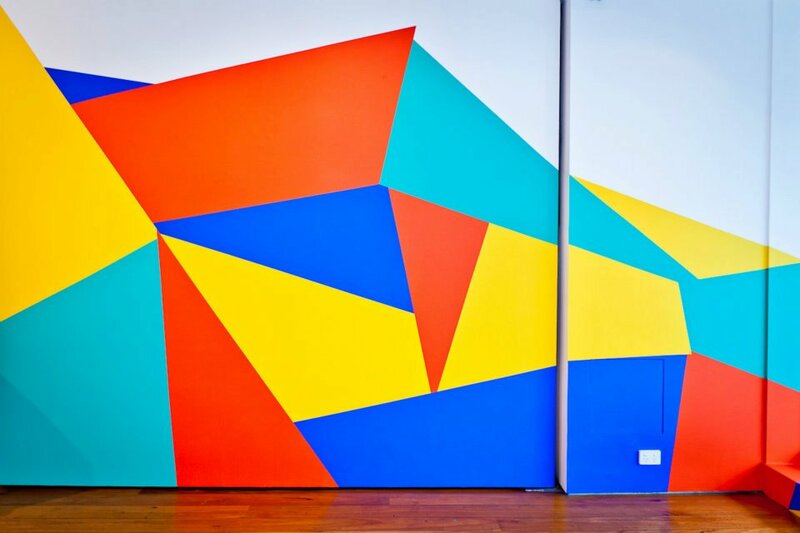 Assemble is a dynamic and immersive collage installation that utilises contrasting colour relationships and large-scale forms to activate space. 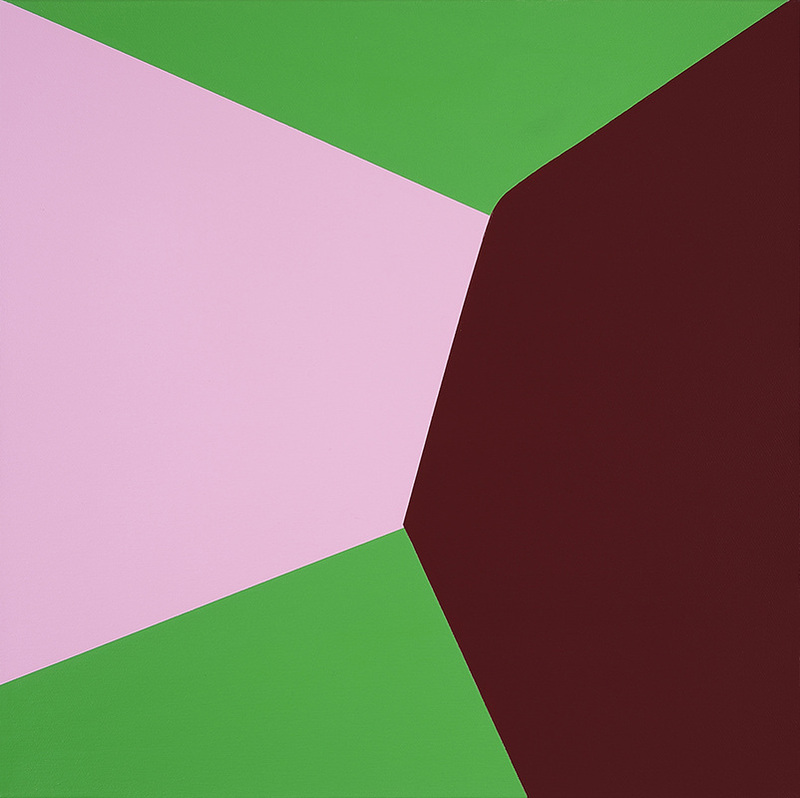 Geometric shapes are reconfigured through many variations, interacting with their surrounds and each other to create visual structure. D11 Supporters' Exhibition at D11 @ Docklands featuring over 50 artists. 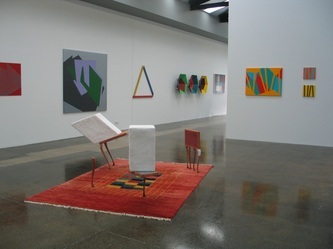 D11@Docklands is an artist-led exhibition space that features curated exhibitions that support an interdisciplinary approach to contemporary art practice. Commissioned by the City of Melbourne, MAB Corporation and Places Victoria, Docklands Spaces is a pilot initiative by Renew Australia to activate some of the currently underutilised spaces in Docklands through incubating short-term uses by creative enterprises and independent local initiatives. 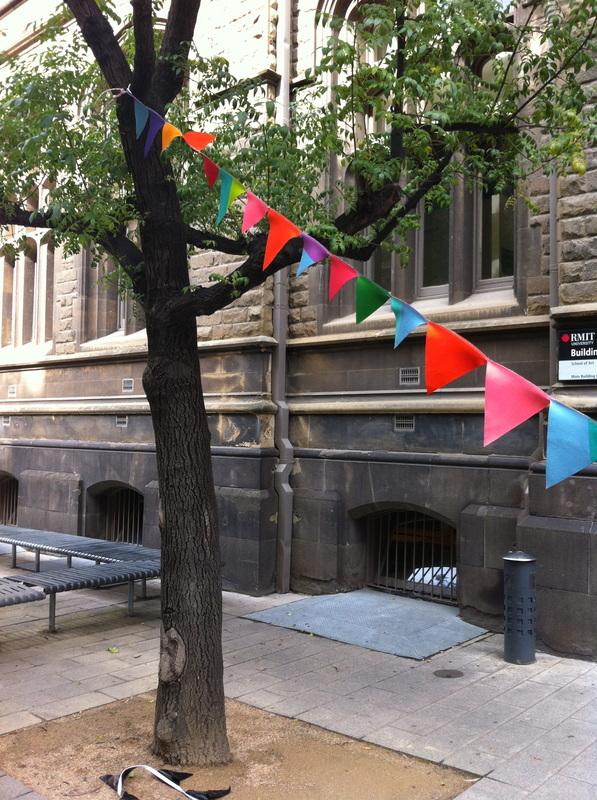 Students, Alumni & Friends of RMIT were invited to participate in a large scale bunting project across the RMIT City campus grounds as part of O Week 2013. Aliça Bryson-Haynes, Andrew Tetzlaff, Annette Chang, Annette Phillips, Beka Hannah, Cristina Palacios, Hannah Evans, Hayley Scilini, Jack Whitmore, Josephine Mead, Julie Kiefel, Leis Carson, Liam Revell, Mary Hackett, Melanie Joy Caple, Polly Hollyoak, Prue Stevenson, Silly Rabbit, Simon Pericich, Skye Williams, Stephen Gallagher. Immersion Complex is the creation of an abstract spatial construction. It is three artists responding to the gallery site, with the space and their interaction determining what is to be constructed. 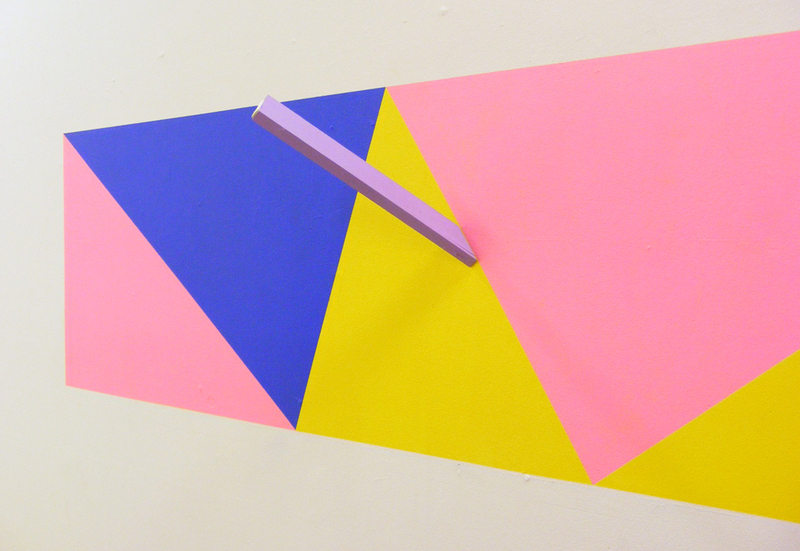 This new collaborative offering by make+shift+projects brings together the artistic practices of Amanda Airs, Hayley Scilini and Lisa Frankland. Adriane Hayward, as curator, mediates what is constructed in the space. What is created is the Immersion Complex, a site-specific artwork that has been produced through the directing of a creative process. The forms in Immersion Complex are derived from Cartographic data; where data from each artist’s interaction with the internet has been collected to create maps that have informed the construction of the work. This is evident in the connecting and intersecting lines that span the space; these lines converge to form pathways. We invite you to interact with the space by negotiating your own path through the construction. 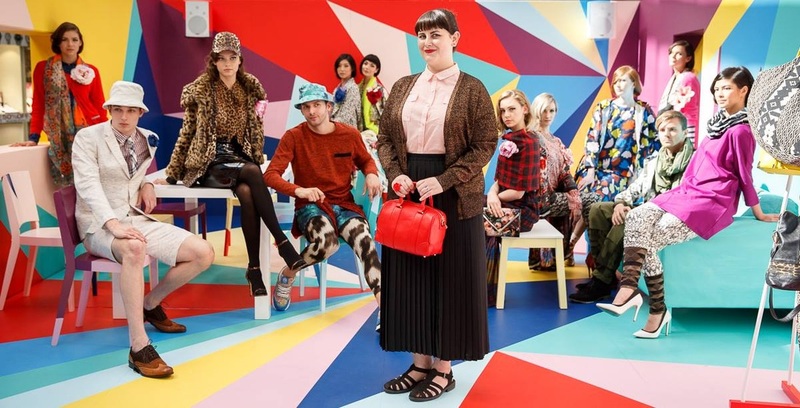 The Second Collective have organised a wearable art show in RMIT's Rodda Lane. Artists were asked to respond to the curatorial challenge by making a wearable piece of art that reflects, celebrates or subverts their own artistic practice. Rather than continue to support a static, ‘hands-off’ approach, whereby items that are inherently meant to be touched and felt are, ironically, removed from touch, Wear Art Thou? 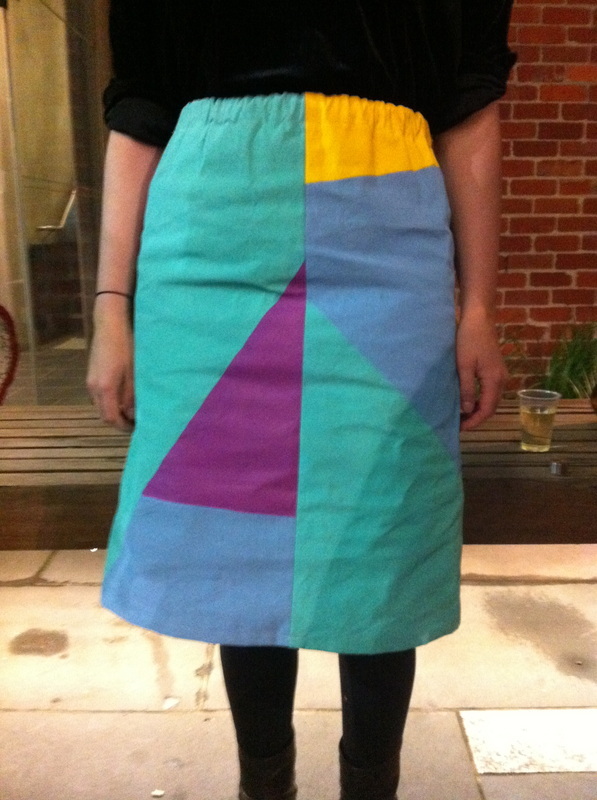 proposes that the inherent materiality and function of wearable art be celebrated – by being worn. Friday Oct 28th from 5pm. Features: Hayley Scilini, Amanda Airs, Tul Suwannakit, Caitlin Telford, Michael Carolan, Beka Hannah, Jade Burstall, Nico Reddaway, Mary Hackett, Claire McArdle, Debbie Harman, Nick Hackett, Giordano Biondi, Lisa Czapnik, Reece Conner, Rushdi Anwar and mystery guests. 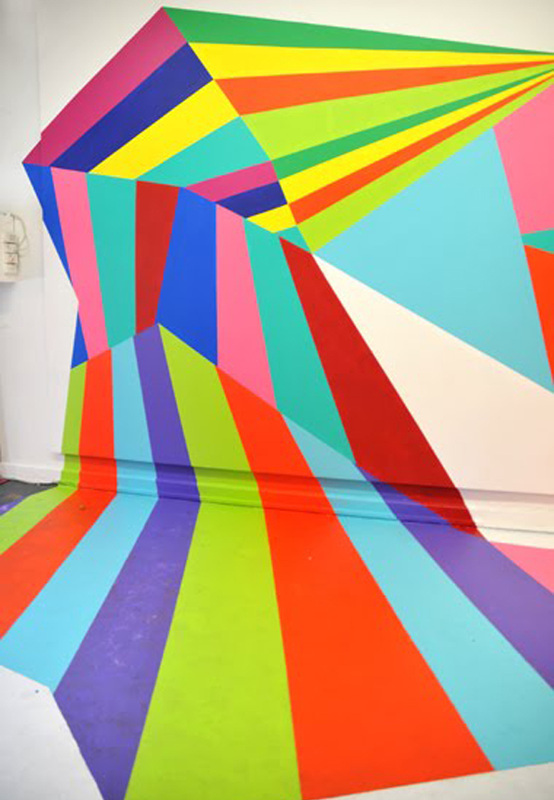 Mecca Cosmetcia have collaborated with 7 Australian artists to present 'The Art of New Colour' 2012. 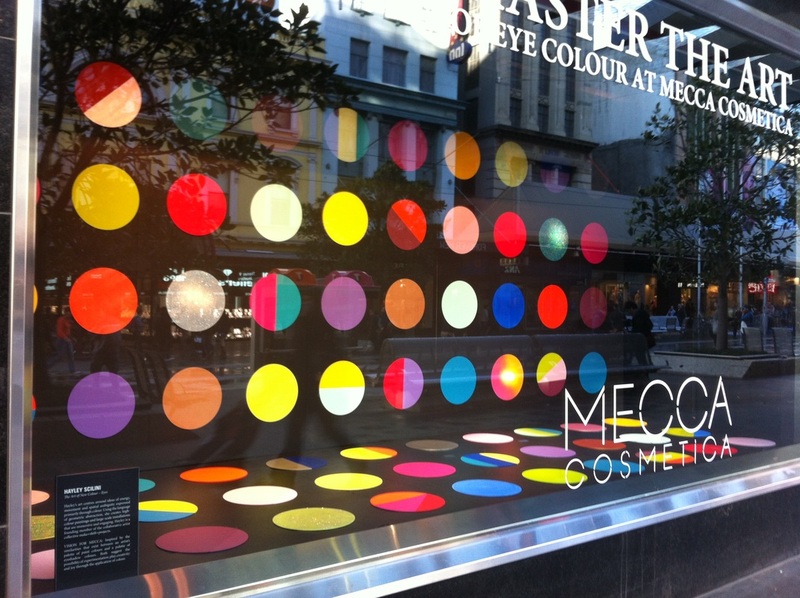 Each artist will present their installations for Mecca Cosmetica at the Myer Melbourne City and Sydney City windows from 4th to 26th September. More details and images on the Mecca Beauty Blog. 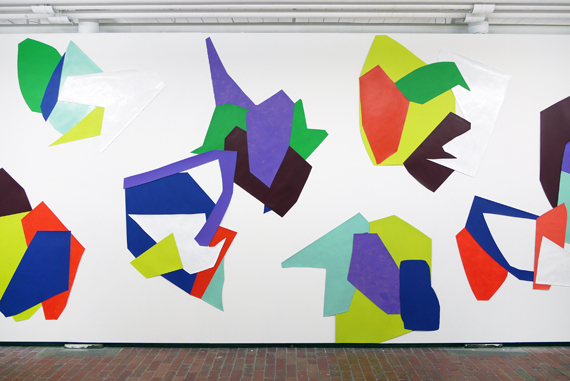 'Awkward Sideways Glances' maps the collaborative interaction of four individuals in three ways. 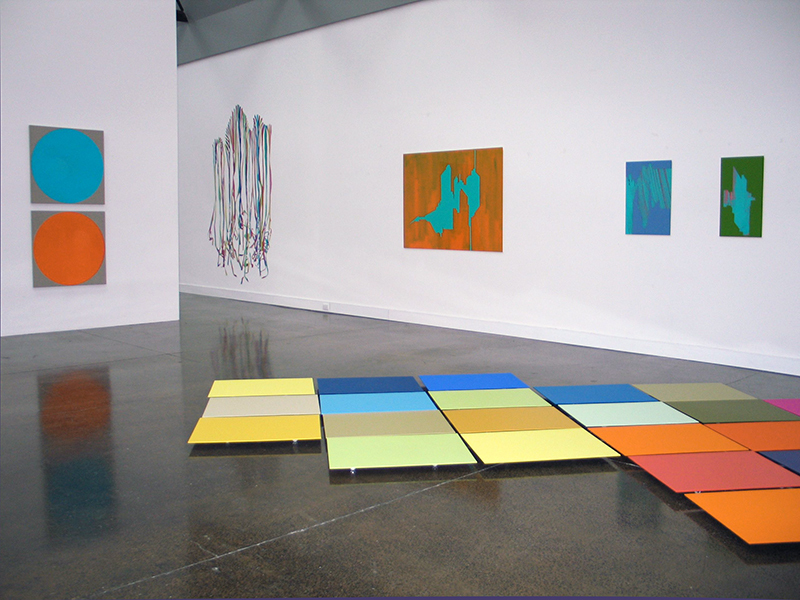 An intersection will occur between the close collaboration of two artists in Melbourne, work sent from Queensland by another artist and finally the mediation of these works in the space by a curator. Ideas of authorship, play and control will surface as artists transform the space through abstract spatial constructions. Amanda Airs, Eric Bridgeman, Hayley Scilini. Curated by Adriane Hayward. 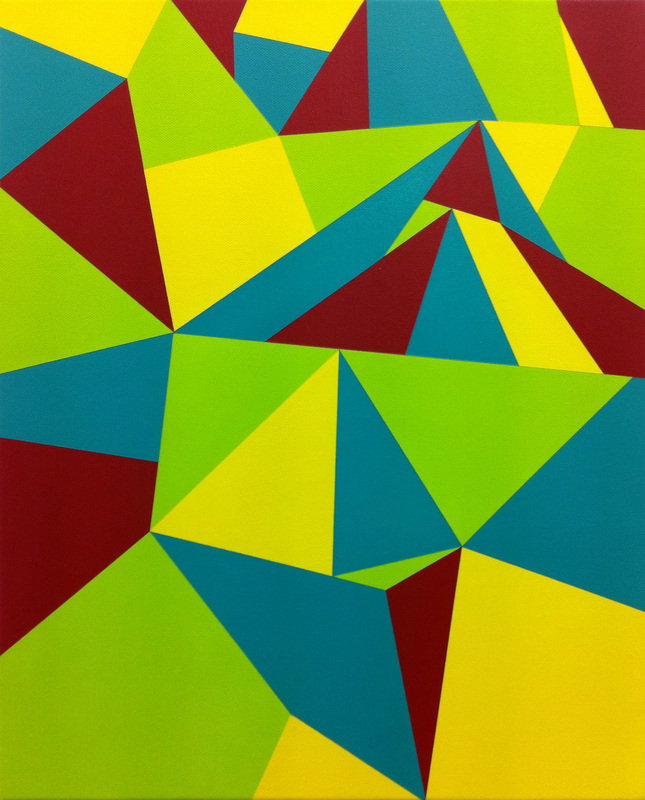 Frames of Reference is a group abstraction show, curated by Dr. Wilma Tabacco showing at Langford120 from June 16 - July 8th. The opening will coincide with the publication launch of Janet McKenzie's Contemporary Australian Drawing #1 with William Kelly as guest speaker. Features: Samara Adamson-Pinczewski, Raphael Buttonshaw, Wayne Conduit, Peter Kartsounis, Jennifer Goodman, Craig Easton, Emma Langridge, Anne Mestitz, Suzanne Moss, Hayley Scilini and Antonia Sellbach. More images can be viewed on the Langford120 website. Amanda Airs, Hayley Scilini and Adriane Hayward of make+shift+projects collective transform Kings ARI into a wild geometric installation of triangles and ponies for one night only. Triangle Pony is about triangles, and a little bit about a pony. 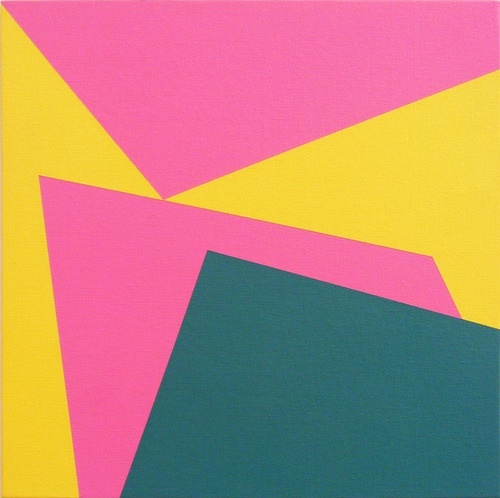 Colorful geometric triangular patterns will be projected into masses of triangular forms, play with light and shadow will create optical illusion. 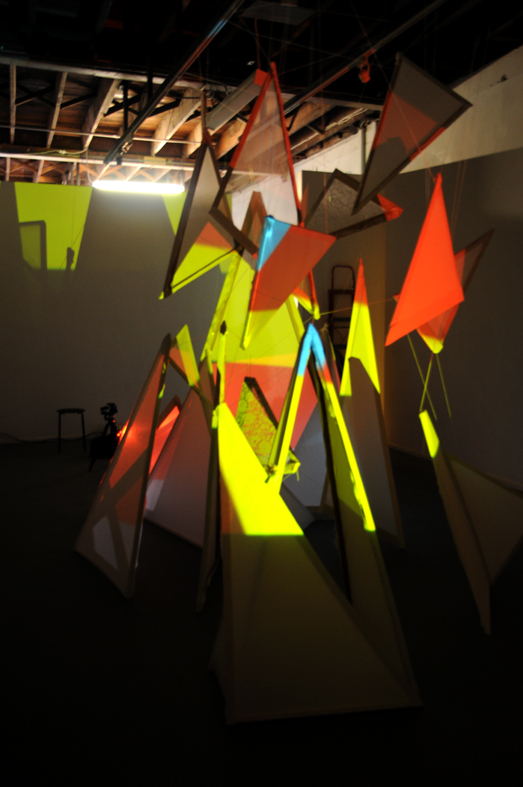 Make+shift+projects collective will construct an original site-specific installation for one night only. This immersive abstracted landscape will then be dismantled at the end of the night. This will be an open-ended collaboration between two artists and a curator where the result will be unknown. Triangle Pony will question ideas surrounding authorship, control and artistic integrity. Look hard for the pony. A group exhibition with works by Hannah Bertram, Mary Hackett, Clinton Haydon, Ben Howe and Hayley Scilini and Todd Stratton. This exciting show comprises installation, painting, photography and metal work to create a sensory exhibition of diverse media. 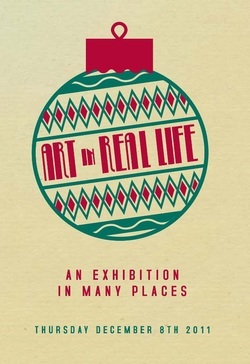 Based on the tradition of the Christmas lights tour, 'Art in Real Life: An exhibition in many places' is a travelling exhibition of a different kind - a fanciful trail, a bus ride with performance, an expedition to the home and neighbourhoods of ten Melbourne artists. Presented by Coalesce ARI. 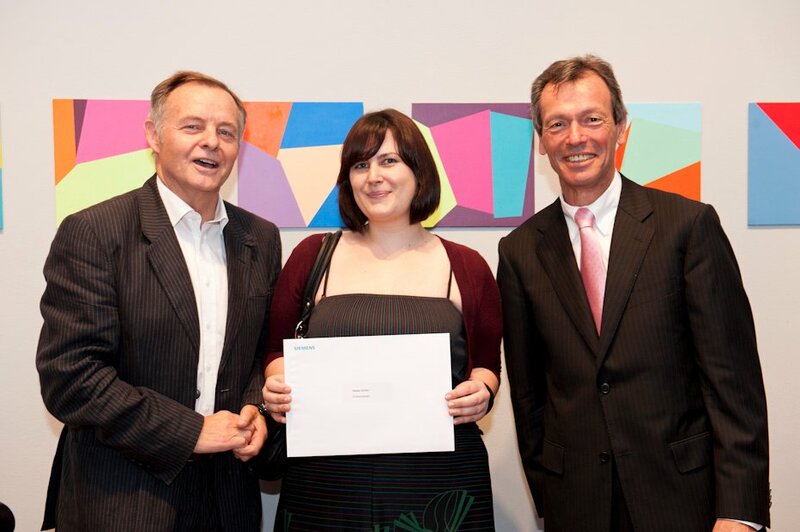 Very excited to have been awarded a $1000 non-acquisitive prize from Metro Gallery for my painting installation in the RMIT MFA Graduate Exhibition. Many thanks to our supporters Metro Gallery, Anna Pappas Gallery, Dark Horse Experiment and Melbourne Etching Supplies who also donated prizes. The Art Melbourne -affordable art fair is on this weekend from Thursday - Sunday. 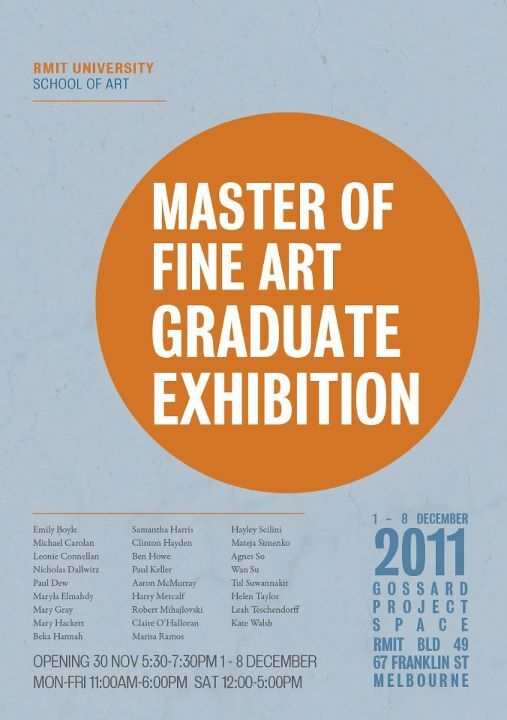 I will have some paintings on show at the RMIT School of Art Gallery stand from my recent graduate exhibition. I'm delighted to announce I have been selected as a winner in the Undergraduate category in the annual Siemens RMIT Fine Art Travelling Scholarhip for my series Experimental Slippages. 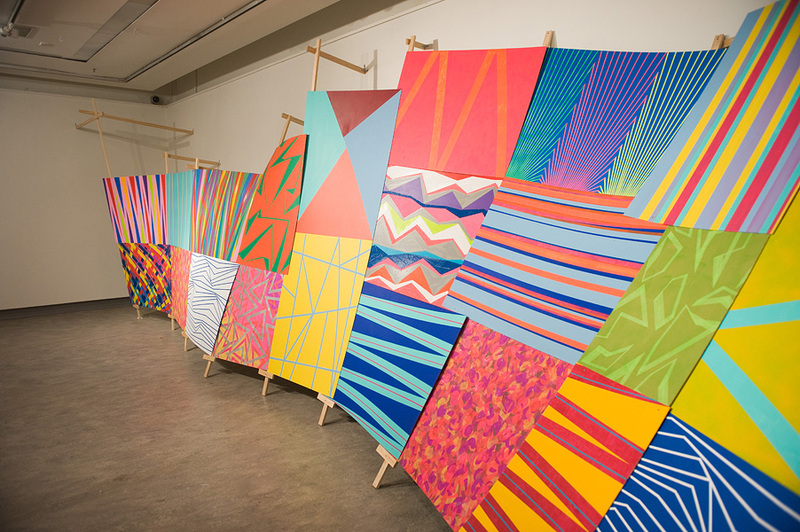 The work is on view in the exhibition until January 8, 2011.